POLE vaulter Ernest John ‘EJ’ Obiena spent the holidays training in Poland as he tries to make the qualifying standard for the Rio De Janeiro Olympics. The 19-year-old Obiena set a new Philippine record of 5.45 meters in the local weekly relays last year and has been training under coach Vitaly Petrov in Poland. “He has been there since December 19,” said Philippine Athletics Track and Field Association president Philip Ella Juico. Obiena won a silver medal in the 2015 Southeast Asian Games with a leap of 5.25 meters, and his record of 5.45 is.25 meters short of the Olympic standard of 5.7. There are unconfirmed reports Obiena has cleared 5.6 meters in practice jumps. 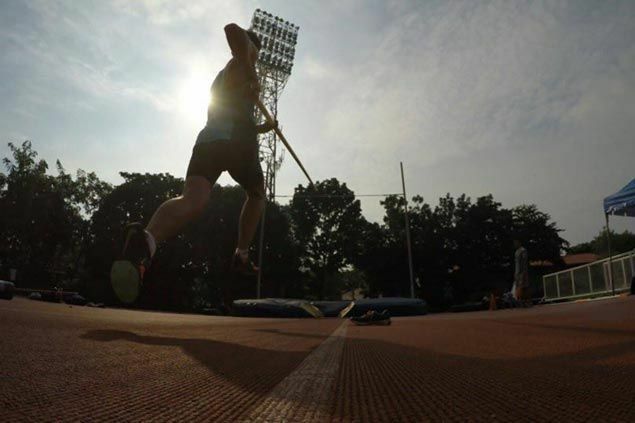 The 6-foot-2 Obiena, son of former national pole vaulter Emerson Obiena, will return to the Philippines later this month to compete for University of Santo Tomas in the UAAP Season 78 athletics competition before heading to Doha to compete in the Asian Indoor Championship in February. “That will also be used as an Olympic qualifying so we hope that EJ will be able to get the Olympic standard,” said Juico.